10x Zoom, 60 m. IR. 10x Zoom, 40 m. IR. Our mini speed dome cameras with 10x zoom are designed for all those applications which require small size PTZ cameras. Thanks to their minimum overall dimensions, these cameras fit perfectly residential and commercial premises, where our bigger 30x speed dome would look out of place. Like all our PTZ cameras, these cameras can turn in any direction and zoom in and out according to the commands of the operator. They can also make predefined automatic movements. These cameras are called High Speed Domes because they are able to move much faster than our standard PTZ cameras. The Pan Tilt head turns up to 200°/sec . The speed of the movement can vary according to the pressure on the control joystick and also adjusts automatically according to the zoom ratio of the lens. This range of mini speed dome cameras include versions for outdoor, with IP66 protection degree, as well as indoor versions. Thanks to their stylish, neat design with front black glass, waterproof versions are very nice for indoor too. Mini speed dome cameras are the latest development in our range of motorized cameras. They provide the same features of our bigger 30x speed dome cameras but in a much smaller casing of just 14 cm diameter. With our mini speed dome cameras you can install a PTZ camera in any decor, indoor and outdoor, adding a touch of elegant high technology. These cameras come with 10x zoom lens that the operator can control from remote. Cameras feature a precise autofocus system (can be switch to manual if required) in order to adjust the focus automatically according to the target distance. Zoom speed is adjustable. Pant/tilt dome speed can be set to change automatically according to the zoom level. Speed dome cameras in this range support AHD technology @ 720P and 1080P resolution. AHD technology is the latest development in the analog CCTV industry. Launched in May 2014 by Nextchip, worldwide leader in DSP for CCTV cameras, AHD technology brings analog cameras up to HD720P (1280x720) and Full HD1080P (1920x1080) video resolution. Before AHD, megapixel resolution was only reached by IP or HD-SDI digital cameras. Connected to latest generation AHD DVR, these cameras provide megapixel resolution, with no latency, still being low cost and easy to install as standard analogue cameras. Like any analog cameras, AHD cameras can be wired by normal coaxial or twisted pair cables up to several hundreds meters. 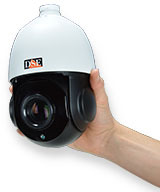 Our range of AHD speed dome cameras includes 1 megapixel (720P/960P Ref. xxHD) and 2 megapixels cameras (1080P Ref. xxFD). 720P cameras can be used with any of our AHD DVR, while 1080P models require 1080P AHD DVR. In order to provide the maximum compatibility with all DVR, most of our analog speed dome cameras are able to support different standards. 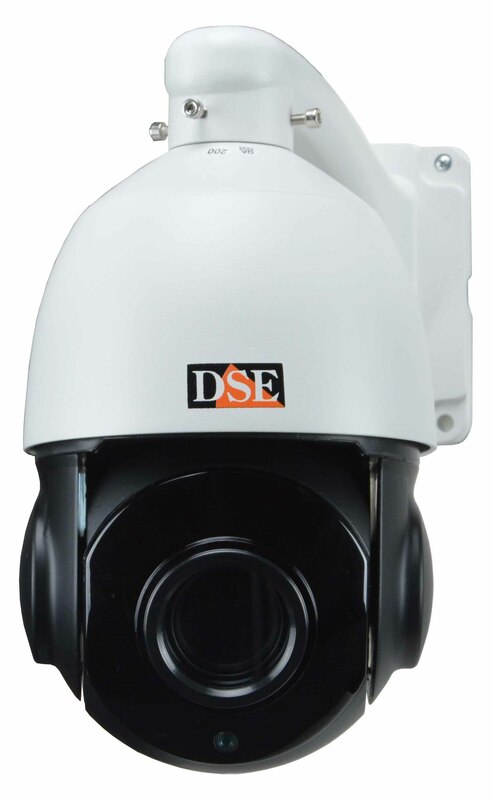 Most speed dome cameras in this range can be used in two different ways: like normal analog cameras (CVBS) or like AHD cameras. In normal analog mode, these cameras provide 1000 TVL resolution and can be used with any standard DVR @ D1 (704x576) or 960H (960x576) resolution. We choose 1.4 and 2 MP SONY EXMOR CMOS sensors for all our AHD cameras. Cameras come with a built-in 850 nm. infrared illuminator which allows a maximum illumination range of 60 or 40 m. according to the model. All cameras include the day & night feature so they provide color video during the day and B/W view at night. The day & night feature is made by Infrared Cut-Filter Removable (ICR) which provides better low light sensitivity and superior color rendering of other cheaper technologies. The control cable for speed dome cameras is a twisted pair which connect all speed dome one to the other. Each camera is identified by a unique ID address from 1 to 256. The ID of each camera is normally set by dip-switches on board. Besides this hardware configuration, SD cameras also support software addressing, particularly useful for quick setup of large systems. Preset can be called by keyboard just by entering the ID number. It is also possible to configure automatic TOUR (also called CRUISE or PATROL) among several preset. Speed dome cameras can monitor large areas by turning continuously at 360° or between 2 predefined limits in order to provide a panoramic view. DSE speed dome cameras have the auto-flip function so can turn automatically 180° in order to follow movements that turn over 90° on the vertical axis. 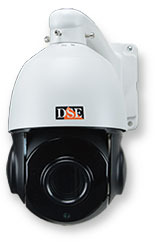 DSE Speed domes can record any custom-made sequence that can be re-called by keyboard and be executed automatically. This function is generally known like PATTERN recording. These cameras automatically recall a predefined function (preset, scan, tour, pattern) in case no commands is received for a certain stretch of time. This is called HOME or IDLE function. A time scheduler is also included to switch on automatic functions according to the time of the day. Besides standard power and video cabling, PTZ cameras require one twisted pair for control. 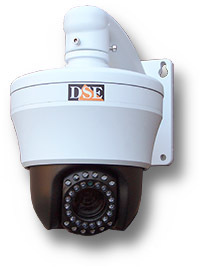 All our speed dome cameras can be controlled by our DVR which come with an RS485 port for this purpose. Through our DVR you can move PTZ cameras with your mouse and even over the web by PC or smartphone. If you prefer a traditional joystick control, you can also move these cameras with our speed dome keyboards which are very convenient to use for local control. DSE speed domes commands are based on the very common PELCO P/D protocol and are suitable to be controlled by any other equipment supporting this standard. These camera are designed to work hanged on appropriate brackets. The wall mounting bracket is included with the camera. Other kind of mounting brackets are available to be purchased separately according to the mounting conditions. Speed dome cameras require 3 kinds of cabling: video, power supply and RS485 control BUS. VIDEO - cameras can be directly connected to DVR using a 75 ohm coaxial cable such as CV-RG59 Alternatively, video can be transferred over a twisted pair by converting the signal with video balun. AHD cameras connects exactly as all other analog cameras, but provide HD resolution only with AHD DVR. All 720P AHD cameras can be switched to CVBS (standard analog video) if required. POWER SUPPLY - The camera takes a 12 VDC power supply. To convert 220V mains power into 12 V DC, a 3A power adaptor is included. In case you prefer to power the cameras from a single power point you can use a cabinet power supply unit like RE-AL20. 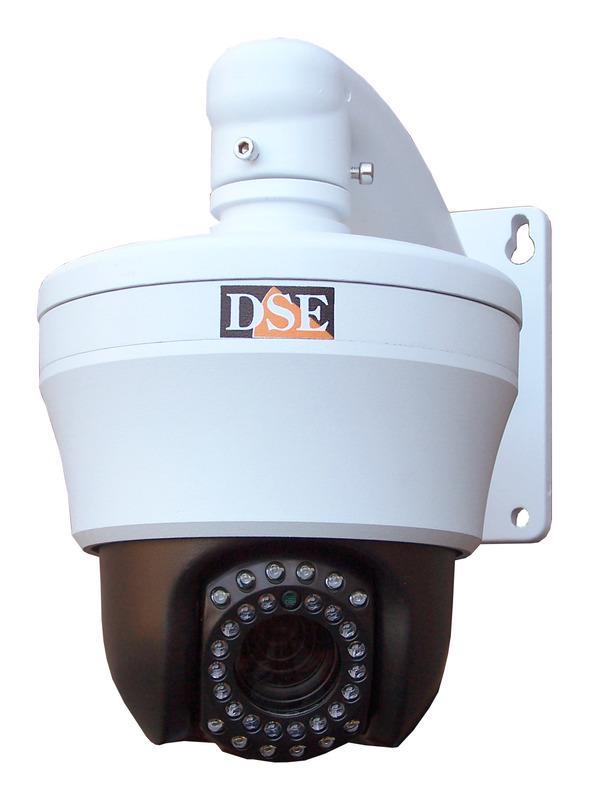 RS-485 - Speed dome cameras are controlled by means of a twisted pair cable (RS485 BUS) that connects all cameras in series and can be up to 1200 m. long. 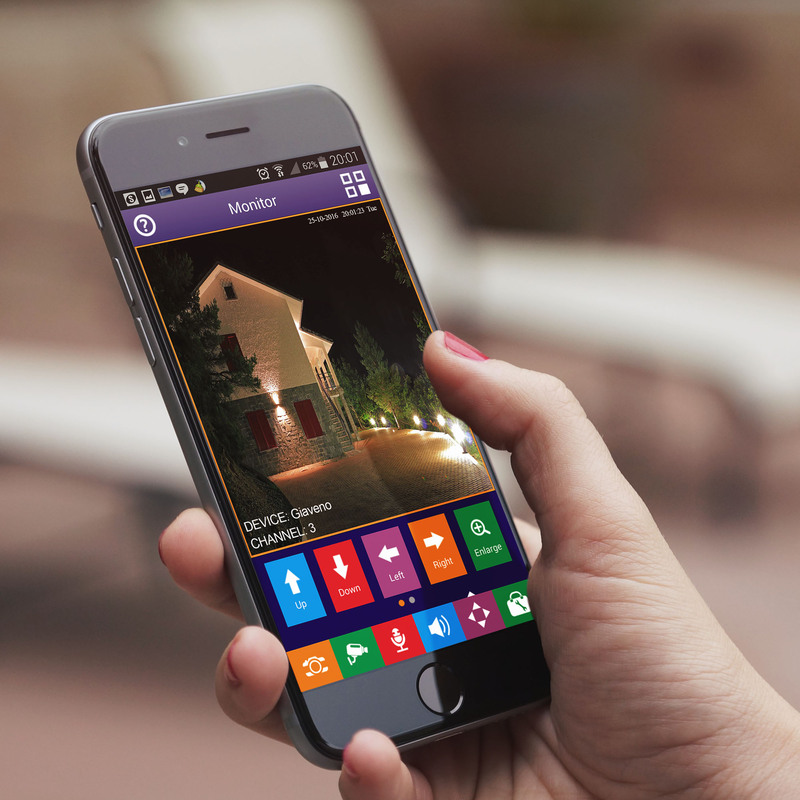 Each camera has its own switch programmable ID code, so can be controlled independently. Up to 256 camera can be connected on one bus and controlled from remote using control keyboards or DVR. A good cable for short distance wiring of speed dome camera is the classic LAN cable CV-CAT5E which including 4 twisted pairs allows transferring video (with balun) + power + RS485 with a single cable. For those with less experience, or needing to refresh their knowledge, the tutorial section contains a number of lessons explaining how to wire and install a hard-wired CCTV system correctly.